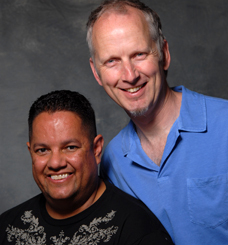 Rodriguez ( left ) and Sinski are long-time partners active on a variety of LGBT, AIDS and youth issues. Committed to making sure young people grow up with access to resources and surrounded with an array of supports and opportunities, David Sinski has many years of experience working with youth programs. At Alternatives, Inc., he served as Director of Youth Development Programs. Prior to that assignment, he spent eight years as Associate Director at Mujeres Latinas En Acci�"n including one as interim executive director. In his current position, David serves as the Executive Director of After School Matters and has held this position since 2005. He started at the organization in 2001, serving first as the sports program director and then as the senior program director. Sinski has numerous volunteer experiences in Chicago including work for ALMA, the Howard Brown Health Center, the Center on Halsted and AIDS Care. He gratefully shares his life with his partner, Julio Rodriguez, and many close friends and family members.